What would you do if you could spend less money on web hosting while still getting the same great service? You’d take the deal, wouldn’t you? Since I love to hustle and bargain, I managed to negotiate an unbelievable deal from Bluehost to WebsiteSetup.org visitors. Full disclosure: I earn a commission if you end up purchasing Bluehost through my referral links in this post. This helps me to keep WebsiteSetup up and running and up-to-date. Thanks for your support. How do I sign up Bluehost using this coupon? It’s easy! Start by visiting the link and hitting the green “Get Started” button. On the following page, choose the package you want to sign up for. If you want more features, such as unlimited websites or high performance, choose the Plus or Pro package. Once you’ve decided on a package, click the green “Select” button below the package you want. Next, you’ll either choose a new domain name–which is your website address, such as example.com or sign up for hosting using a domain name you purchased elsewhere. How can I activate the discount? It ONLY works for WebsiteSetup.org visitors. You should be able to see $2.75 price when you visit the link. This is the price that will apply at checkout. How do I install WordPress on Bluehost? WordPress is a content management system (CMS) that delivers the tools needed to build your website’s content and layout. It’s a free open-source program which Bluehost has made easy to use alongside their hosting packages. On the next page, click the green “Install” button. That will bring you to a page with a drop-down menu asking you which domain you’d like to install it on (if you have more than one). Choose the appropriate domain, then hit the green “Check Domain” button. Note: You can choose your domain with the “www.” or without it. You may want to choose the option without “www.” to make your URL shorter. The last step is to configure your WordPress settings. Check the box next to “Show Advanced Options” to name your site, to give yourself a new admin username, and to set your admin password. 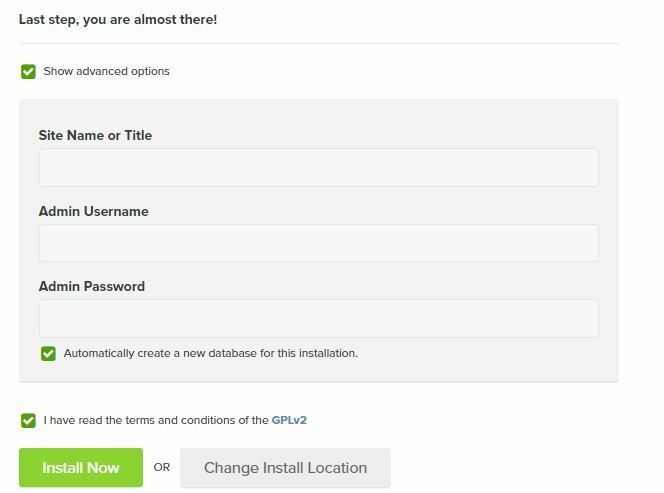 After you’ve read through the terms and conditions, click the green “Install Now” button. In the next window, you will see a progress bar. Don’t close the window until it shows that the installation is complete. Once you see that WordPress is installed on your site, you’ll receive a confirmation email to your registered email address where you can find the details about your login information and the URL where you can access your WordPress dashboard. Now you’re all set to begin building your site for the public using WordPress’s software! What other perks can I get using this coupon? One-click WordPress Installs – This is the process we reviewed above. 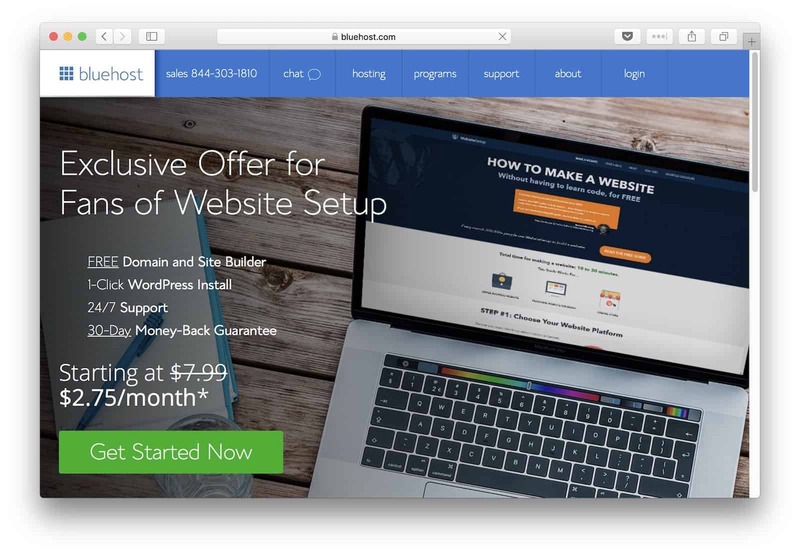 Bluehost makes it simple to build your website with WordPress, even if you’re completely new to building a website yourself. Free Domain Name – Your first domain name is included in the price of your package. Should you choose to switch hosts later, you will still retain ownership of the domain name. It means that you can manage it, transfer it, or point it to another domain. Unmetered Bandwidth – Bluehost does not bill based on bandwidth used, which means you’ll have all the resources available to you to run your website without experiencing adjusted fees for bandwidth use. Email Accounts – Through Bluehost, you can set up email accounts using your own domain. For example, you could create a contact email like [email protected] The Basic package includes 5 email addresses with 100 MB of space per account. 24/7 Support – In-house experts are available 24/7 to answer your questions. Start by perusing the FAQs page, if you can’t find answers there, get in touch through chat or phone. Yep! Bluehost allows you to cancel your service at any time. If you cancel within the first 30 days, you’ll receive a full refund. If you cancel after 30 days, you’ll receive a prorated refund based on the remainder of your term. Keep in mind that some add-ons, such as domains, are not included in this guarantee; it only applies to the hosting charges. What are those ‘Add-ons’ that Bluehost recommends while signing up? In addition to your hosting fees, you may choose to pay for add-ons provided by Bluehost. These are completely optional, but you may find that they’re useful. Let’s break down these options. Domain Privacy Protection – Did you know that anyone can look up who owns a website through tools like WhoIs.net? Although this information is public record, you can keep your information – such as your email address and mailing address – private by opting in for domain privacy protection. Instead of listing your information, Bluehost will list their info so that spammers and other individuals can’t reach you that easily. Site Backup Pro – Site Backup is an extra service that adds a layer of protection to your site. Should something happen to the files – for example, if your site is infected with a virus – Bluehost will have saved copies backed up on their servers. This makes it easy to restore your site in a crisis. The backups are automatic and occur at daily, weekly, and monthly intervals. Additionally, if you need to restore your files, you can choose to restore the full site, or you can hand-pick certain files. Search Engine Jumpstart – This add-on does some of the search engine optimization (SEO) for you by getting your site listed on Google, Yahoo, and Bing! within a few short days. With this service, you’ll receive rapid indexing, a head-to-head comparative analysis report, a step-by-step DIY SEO program, and a search engine mastery eBook. SiteLock Security – SiteLock is a feature that helps to ensure your site is secure while giving your site visitors a reason to trust you. It automatically scans your site for malware, checks your site to make sure it’s free of spam lists, validates your business, and reduces your chance of being quarantined by search engines. If your site is safe, it will display SiteLock certification to boost your credibility and increase conversions. Although you are not required to purchase these add-ons, they can be worth the extra security they provide. At our promotional price, you’ll receive the lowest rate possible for your first term, which lasts for 12 months. If you’d like to continue working with Bluehost, you can renew your hosting package at the normal rate, which is currently $7.99 for the Basic package. If you’d like to upgrade your hosting package, regular rates are $10.99 for the Plus package and $23.99 for the Pro package. You will also have to renew your domain name annually, which usually costs around $11.99 through Bluehost. With affordable hosting packages, what are you waiting for? We’ve got you covered on the best deal for your first year, so check it out if you plan on launching your own website.